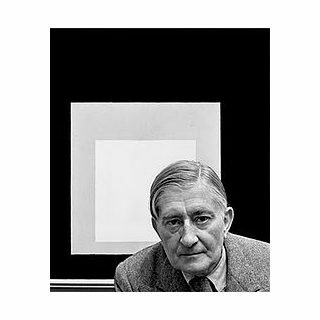 Accomplished as a designer, photographer, typographer, printmaker, and poet, Albers is best remembered for his work as an abstract painter and theorist. He favored a very disciplined approach to composition. 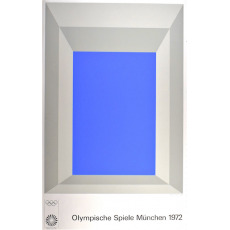 Most famous of all are the hundreds of paintings and prints that make up the series, Homage to the Square. In this rigorous series, begun in 1949, Albers explored chromatic interactions with nested squares. Usually painting on Masonite, he used a palette knife with oil colors and often recorded the colors he used on the back of his works. Each painting consists of either three or four squares of solid planes of color nested within one another, in one of four different arrangements and in square formats ranging from 406×406 mm to 1.22×1.22 m.
In 1959, a gold-leaf mural by Albers, Two Structural Constellations was engraved in the lobby of the Corning Glass Building in Manhattan. For the entrance of the Time & Life Building lobby, he created Two Portals (1961), a 42-feet by 14-feet mural of alternating glass bands in white and brown that recede into two bronze centers to create an illusion of depth. In the 1960s Walter Gropius, who was designing the Pan Am Building with Emery Roth & Sons andPietro Belluschi, commissioned Albers to make a mural. The artist reworked City, a sandblasted glass construction that he had designed in 1929 at the Bauhaus, and renamed it Manhattan. The giant abstract mural of black, white, and red strips arranged in interwoven columns stood 28-feet high and 55-feet wide and was installed in the lobby of the building; it was removed during a lobby redesign in c. 2000. Before his death in 1976 Albers left exact specifications of the work so it could easily be replicated. In 1967, his painted mural Growth (1965) as well as Loggia Wall (1965), a brick relief, were installed on the campus of the Rochester Institute of Technology. Other architectural works include Gemini (1972), a stainless steel relief for the Grand Avenue National Bank lobby in Kansas City, Missouri, and Reclining Figure (1972), amosaic mural for the Celanese Building in Manhattan destroyed in 1980. At the invitation of a former student, the architect Harry Seidler, Albers designed the mural Wrestling (1976) for Seidler’s Mutual Life Center in Sydney, Australia. He was known to meticulously list the specific manufacturer's colours and varnishes he used on the back of his works, as if the colours were catalogued components of an optical experiment. His work represents a transition between traditional European art and the new American art. It incorporated European influences from the Constructivists and the Bauhaus movement, and its intensity and smallness of scale were typically European, but his influence fell heavily on American artists of the late 1950s and the 1960s. "Hard-edge" abstract painters drew on his use ofpatterns and intense colors, while Op artists and conceptual artists further explored his interest in perception. In an article about the artist, published in 1950, Elaine de Kooning concluded that however impersonal his paintings might at first appear, not one of them “could have been painted by any one but Josef Albers himself.” Although their relationship was often tense, and sometimes, even combative, Robert Rauschenberg later identified Albers as his most important teacher.